Manufacture has chosen a smoked sapphire glass, making this ww.tc Cabinet de Curiosités 2011 edition series even more unique. 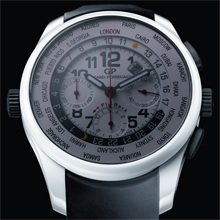 The sapphire glass reveals the white dial and the model’s various functions. 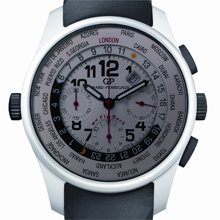 The colour red is used to draw attention to the chronograph second hand and the divisions of the three counters, as well as to highlight London – where the event will be held – on the ring indicating the cities. The enigmatic style of the ww.tc Cabinet de Curiosités continues on the case-back, with its tinted sapphire glass displaying the self-winding Girard-Perregaux GP03387 movement. This famous calibre, specially created for the ww.tc collection, combines simultaneous display of the date, small second and world time zones with a fly-back chronograph. It is housed inside an inner protective shell in ultra-resistant titanium, specifically created by the Manufacture’s engineers. The Girard-Perregaux ww.tc Cabinet de Curiosités is limited to five pieces. Every year, Thomas Erber’s Cabinet de Curiosités provides a showcase for talented creators and bold brands from all over the world, characterised by their unique know-how and their independence. It aims to redefine luxury by regularly offering unique or very limited edition pieces, created especially for an exclusive occasion. Following a successful career in journalism, Thomas Erber is now an international consultant for a number of brands and designers. With this new, contemporary Cabinet de Curiosités, he addresses people of all nationalities and any age who are above all curious and for whom luxury is not defined by price but by a story, a lifelong career and expertise. Thomas Erber’s first Cabinet de Curiosités took place in December 2010 in Paris, at Colette. The second is held at Browns, the oldest concept store in the city from 21st November to 23rd December 2011 in London. Material: white ceramic (inner titanium shell), bezel in steel and white ceramic. Push pieces and crowns covered in black rubber.